I’m in Umbria on a route-finding ‘mission’ for Headwater – one with a slightly religious flavour – to put together the walks for their fantastic new walking itinerary that follows part of the 500km Saint Francis Way (the Via di Francesco) from La Verna to Rome. Well, I’m hoping it’ll be fantastic…once I’ve finished it! To date, this is my 60th trip for Headwater and I’ve field-checked, edited and documented more than 250 sets of walking and cycling notes – some just a single day’s walking, others the full holiday itinerary from scratch. More recently I put together the walking programmes for the new single-centre concept in Brittany, Catalunya and the Dordogne. Since I did my first-ever field trip, things have changed – a lot. Back in the day, all I had was a pedometer, and a ruler and piece of string to measure route distances. Nowadays I feel like Inspector Gadget, with my GPS unit, voice recorders, Smartphone apps and enough cables and chargers to start my own franchise in Currys PC World. A lot of people tell me it’s a dream role and that they’d swap places with me any day. Yes it can be, but it does have its not-so-enviable ‘moments’ too. I’ve been caught in very scary high-altitude thunderstorms in the French and Slovenian Alps, and I’ve had to turn back due to waist-deep snow on the mountain trails of the Dolomites. Still it wasn’t any hardship to have to go back there again after the melt, when the pastures were ablaze with wildflowers. Also memorably, I recently walked nine hours in monsoonal rain in Bavaria, where my maps and paperwork were reduced to a soggy mush and my voice recorder failed to ever work again – even after leaving it on the radiator all night in my hotel room and blow-drying it with the hairdryer. That’s the third one now! I’m not suggesting I’ve given blood for Headwater, but I did once lose four toenails on the Amalfi Coast – tramping around in my fancy new pair of utterly unworn-in hiking boots. I discovered them blackened in a most unattractive way in the end of my socks. Weeks later, after much head-shaking, tutting and some delicate drilling at the chiropodist’s, they all fell out. My ‘office’ this time is the ‘Green Heart of Umbria‘ and I have plenty of information and guidance from the Product Researcher at Headwater HQ. The hotels are all in place (always a good start) and contracts signed; all I have to do is join the dots and find some rewarding walking trails linking Assisi to Spoleto. I have some GPS route options from the web, a 15-year-old walking guidebook and a library of maps and paperwork from Gigi, our Umbria Tourist Board contact. Should be easy, this one, thought I. To aid me in my route-finding and plotting, Saint Francis of Assisi had very kindly trailblazed some of the route for me, 800 years previously (but he failed to pass on his GPS file to me). When he made his final pilgrimage in 1226, this must have been round about the same time the trails were last waymarked. On this trip, my wife Ludmilla is with me. She acts as my second opinion on whether the routes we find are suitable for our paying customers, and if they are the best we can put together – within certain constraints: namely they have to link the hotels. She is also my moral compass and limits how ‘blue’ I turn the air when the planned routes don’t quite work out or fit. But there is usually a solution, and I am determined (and stubborn) enough to find it, however much boot tread and daylight it uses up. 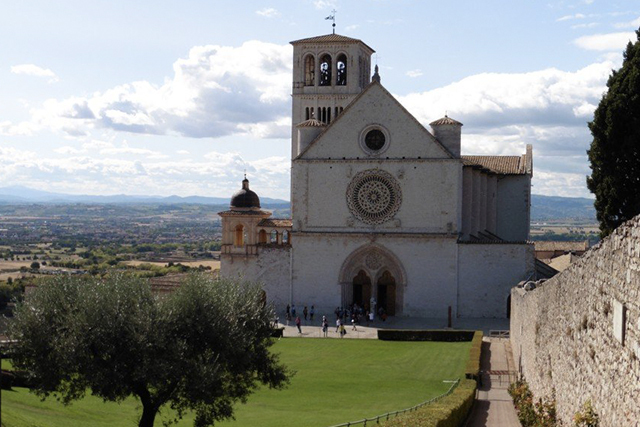 The trail from Valfabbrica to Assisi was an easy start and very pleasant, with a fitting finale finish at the majestic Basilica di San Francescano. Except for the hour-long thunderstorm and downpour that tested our waterproofs to their limit – soggy cheese buns for lunch! – all went well, and the sky was soon blue again for the right reasons. Next up: Assisi to Spello. There are three ‘official’ Via Francescano routes out of Assisi, and another trail called the Sentiero degli Ulivi (Olive Grove Trail). All I had to do was plot the best combination that offered the most varied scenery and the best views. Arriving in Spello a mere 10 hours later – just in time for the sunset and moonrise – we’d finally cracked it and had earned our moonlit pasta suppers twice over. 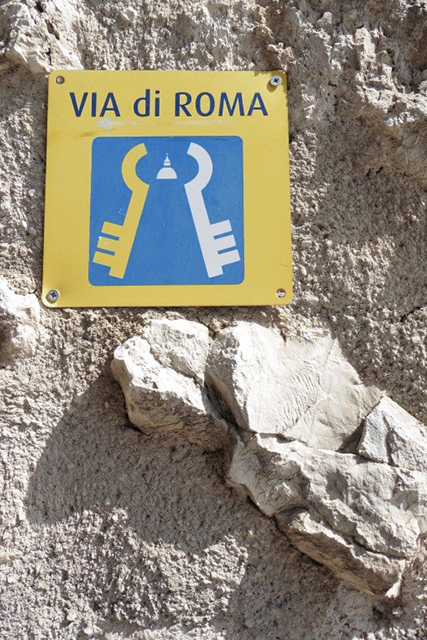 The GPS route I’d been given for the next walk, to Trevi, turned out to be for paragliders only. It took us along a forest trail to a fenced dead-end with a choice of a scramble up a rock face into impenetrable forest, or a leap of faith off a 50-metre cliff into the tree canopy below. 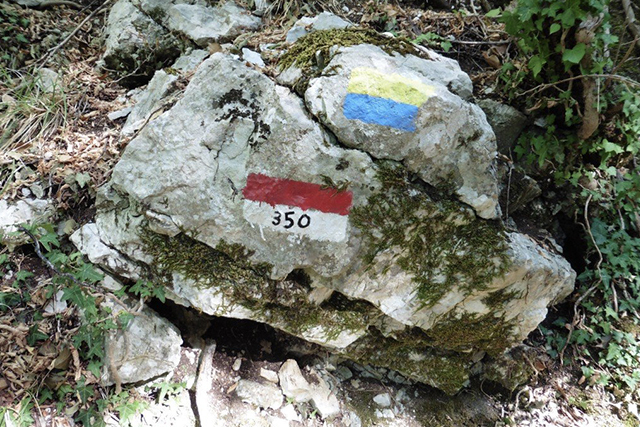 Ditching technology and using an ‘old-school’ map, we followed the trail manually, with faded yellow blob waymarks to guide us. Next time I’ll take my own paint pots and brushes! Trevi turned out to be our favourite place on the itinerary, and it was with the satisfaction of another day ‘jobbed and done’ that I sipped a cool Moretti beer at dinner in the church square. The walk from Trevi to the Borgo della Marmotta luxury ‘farm resort’ in Poreta was a joy and relatively easy to put together. We combined the map routes, the guidebook info, some old military mapping and several GPS files; kept the best and ditched the rest. Simple, really. The final walk, from Poreta (we could have stayed there all week) to Spoleto, was supposed to be a leisurely 15km stroll along the Via Francescano. But by the time we were happy with the results, we’d walked a tidy 30km-and-some, and were very late for an important meeting with Gigi – and the town mayor. Oops! Leaving from Rome the next day, we had succeeded in putting together five lovely walks totalling 75 kilometres, for the customers to complete over a 10-night holiday. In the process, we had clocked up a respectable 150km walking in just five days. We’d completed our own mini-pilgrimage and had successfully followed in the footsteps of Saint Francis – albeit with one or two detours – and I never lost a single toenail! 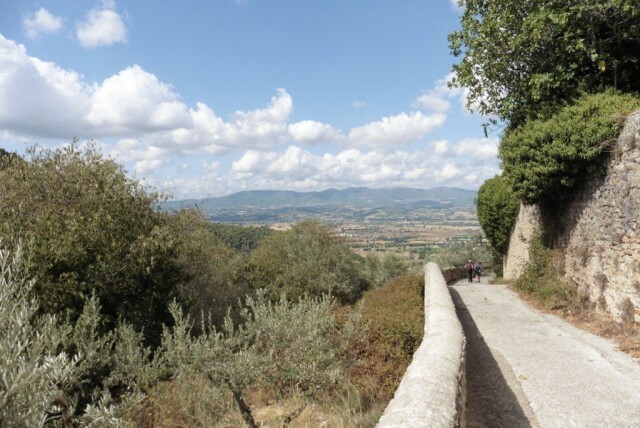 Read more about our new 10-night self-guided trip, Walking the Olive Trails of Umbria. Tony Lewis is a Headwater Rep in the Algarve, Portugal, with his wife Ludmilla. As well as this, Tony also finds, creates, checks and double checks many of Headwater's walking and cycling routes in the regions.